I looked over at the scoreboard fully expecting the score to be 5 (red) – 2 (blue), but it was the opposite. I looked at the scoreboard again, double checked my singlet color, and perplexed made my way back to the center of the mat. Coach Vern Zellner and Coach William Terrell looked over at the score confused as well. As we came back to the center of the mat, I thought someone would fix the score; but the whistle blew again, and I had to keep wrestling. So now, in essence, I was dealing with a 6 point swing against me. Then I remembered the wisdom of the great Donn Ernst. A few takedowns and turns later my hand was raised I won that bout 9-6 and didn’t give much more thought to that match. 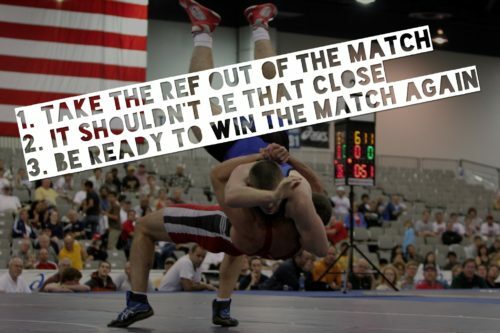 If I would have lost that match, I wouldn’t have blamed the ref but would have placed the blame directly on myself. There is something about the sport of wrestling that teaches personal responsibility like nothing else. Take the ref out of the match. Don’t blame anyone else even when it is the easiest thing to do. Take responsibility for the outcome. 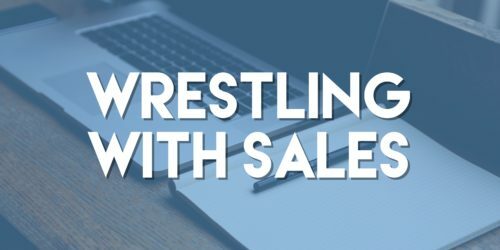 If you miss a sale with a customer, and you feel it was in their best interest, figure out what you could have done better instead of blaming the customer. Whatever objection your customer has you should be prepared to handle it. It shouldn’t be that close. A lot of times you will be up against a variety of competitors for the same customer. In your sales process you shouldn’t plan on doing just enough to win. You have to be head and shoulders above the competition. If you are just going through the motions, your customers will know, and you will lose business. There should be no doubt in your customer’s mind that your solution ALL things considered is the best for them. Be ready to win the match again. You can do everything right with a prospect then at the last minute the incumbent will undercut you, or the decision maker you had worked with gets moved to a different department and now you have to start over again. Complaining doesn’t accomplish anything, you have to get the job done because at the end of the day only results will move you forward not excuses. While I am more than twice as old as when I first heard Donn Ernst shout those words to me in a sweaty garage across from the East Brunswick Mall, they still resonate with me today.